Thanks to Charming Charlie for sponsoring this post. All opinions, as always, are my own. This post contains affiliate links. Charming Charlie is one of my favorite stores to shop at when I’m looking for something for holidays or in a specific color! They have tons of accessories and some cute clothes that are all sorted by color. It makes it so easy to go to their website and find what you’re looking for. Everything is also sorted by color in-store too, which is great due to the amount of items they carry. 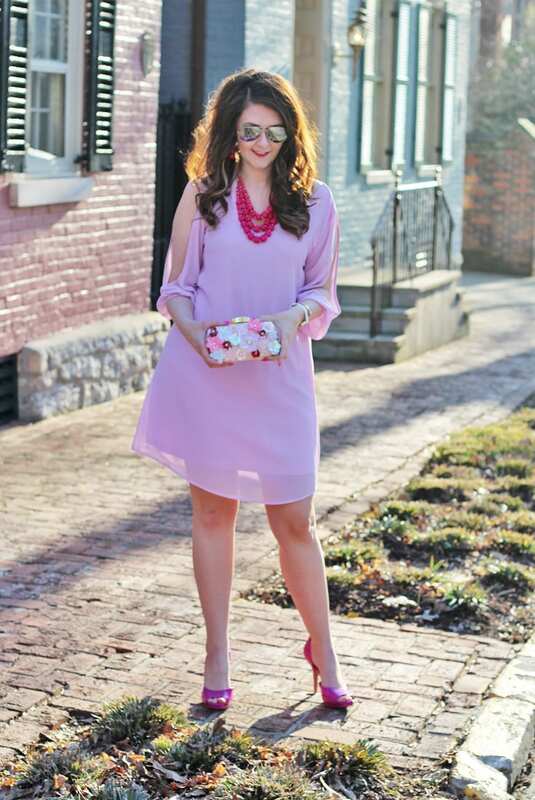 Plus, they have the most darling Valentine’s Day pieces right now! 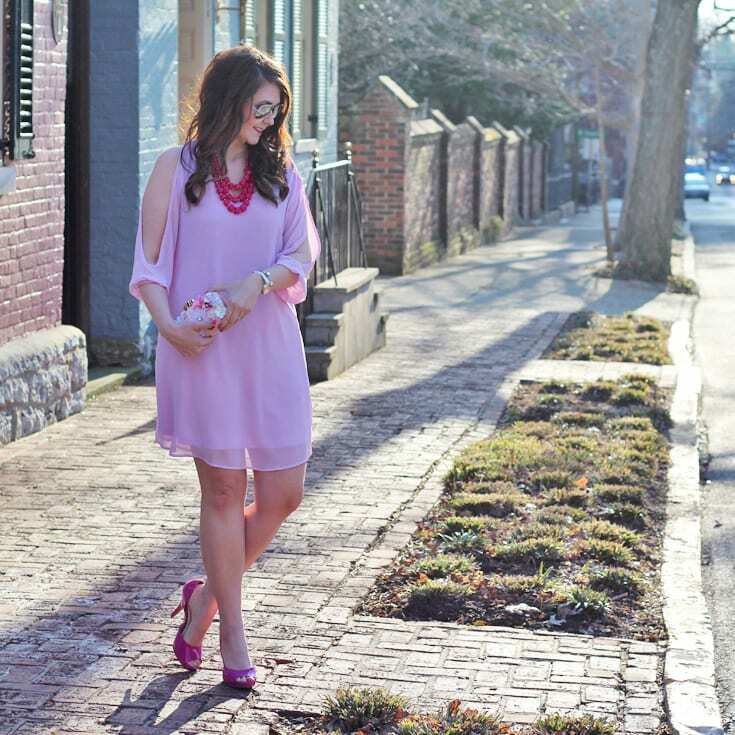 This lilac number is perfect for Valentine’s Day, and will work well for spring and summer too! 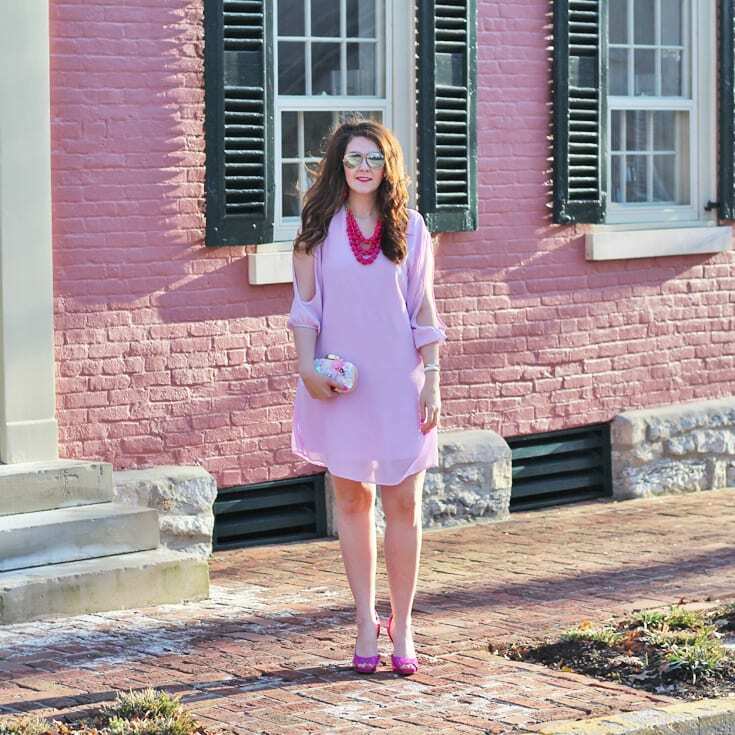 I adore this soft color, and chose to accent it with pink, pink, and more pink. Plus, the cold shoulder style of the dress is so on trend right now. 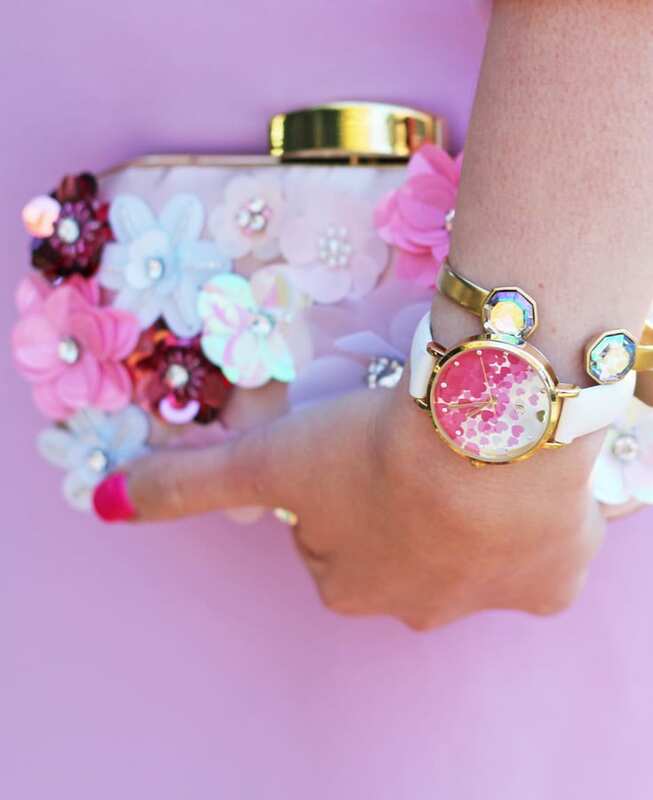 This 3-D floral clutch is the most beautiful clutch! It’s adds the “WOW!” factor and gives the whole outfit a romantic feel. 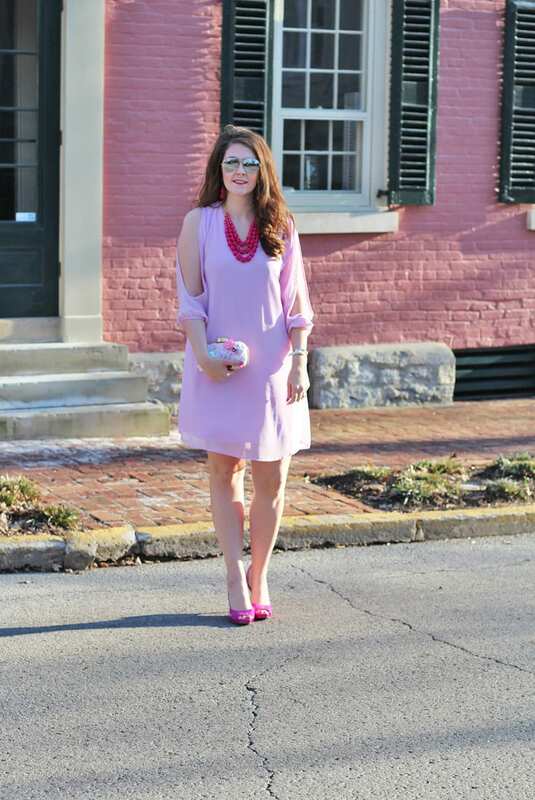 It’s the piece that pulls the whole outfit together, especially bringing in the brighter pinks from my shoes, necklace, and earrings. My necklace and earrings set were a recent purchase in store at Charming Charlie, but I can’t find them online, so I’ve linked similar pieces. And this heart watch adds the cutest Valentine’s Day charm! 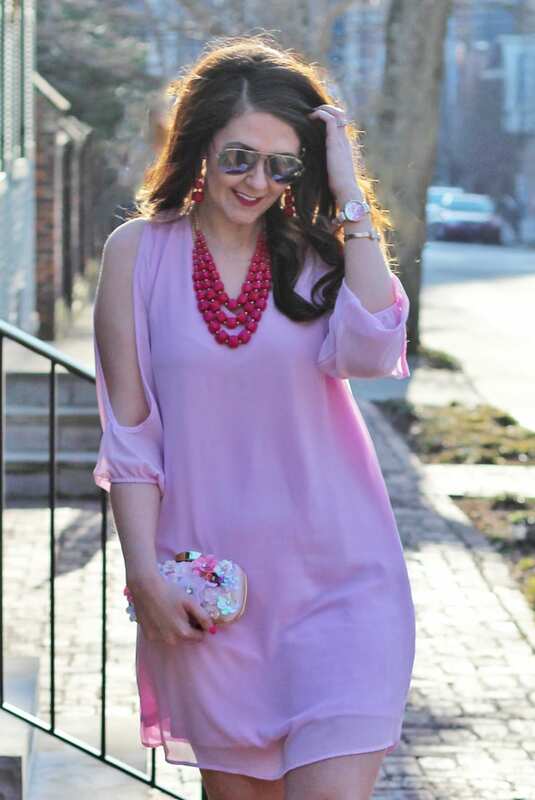 If you’re going on a romantic and dressy Valentine’s Day, then this outfit is definitely for you! How will you be celebrating? SAVE THIS POST FOR LATER BY PINNING IT VIA THE WIDGET BELOW!